Following an enforced hiatus, Fret-King guitars re-launched in early 2008 with an exciting new range of electric guitar and bass models. The brainchild of guitar design guru Trev Wilkinson, the new high-end Green Label instruments are hand-built at the Fret-King Custom Shop in Southport, Lancashire. MusicRadar grabbed hold of Trev at Frankfurt Musikmesse who talked us through the thinking and the materials behind the new Esprit V (starting at £1249) and Corona 60 HB (starting at £1499) models. 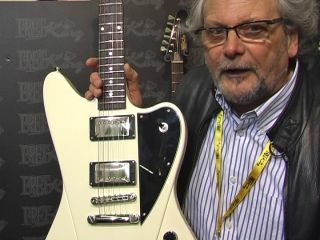 For more information, visit the official Fret-King website.